Xiaomi Poco F1 is one of the popular mid-range smartphones from the Chinese phone maker that offers great value for money proposition. As the fact that the smartphone packs Qualcomm Snapdragon 845 making it the cheapest handset in the market to feature the chipset. To keep things going, Xiaomi officially announced that the device will be offered with a discounted price of Rs 20,999. The company officially tweeted on its handle wherein the price of the 6GB + 128GB variant is slashed by Rs 2000. Xiaomi Redmi Note 7 Pro, Redmi Note 7 Smartphones to Go on Sale Today at Flipkart, Amazon India & Mi Stores. The smartphone will be made available at this price point from March 25 to March 28. The interested customers will be able to get the device at Flipkart and official Xiaomi India website. As far as the prices are concerned, the base variant with 64GB internal space and 6GB of RAM will be retailed at Rs 19,999. On the other hand, the top-of-the-line model with 8GB of RAM and 256GB onboard storage will cost Rs 27,999. Xiaomi Redmi Go Smartphone Launched in India at Rs 4,499; Seventh Manufacturing Plant Officially Announced. Coming to the specifications, the Poco F1 phone bags a 6.18-inch FHD+ display with 18.7:9 aspect ratio and resolution of 2246 X 1080 pixels. Under the hood, the dual-SIM is powered by an octa-core Snapdragon 845 SoC from Qualcomm. The chipset is clubbed with Adreno 630 GPU and 6GB of RAM. Now running Android 9.0 Pie based on MIUI 10, the phone comes with internal memory of up to 256GB. 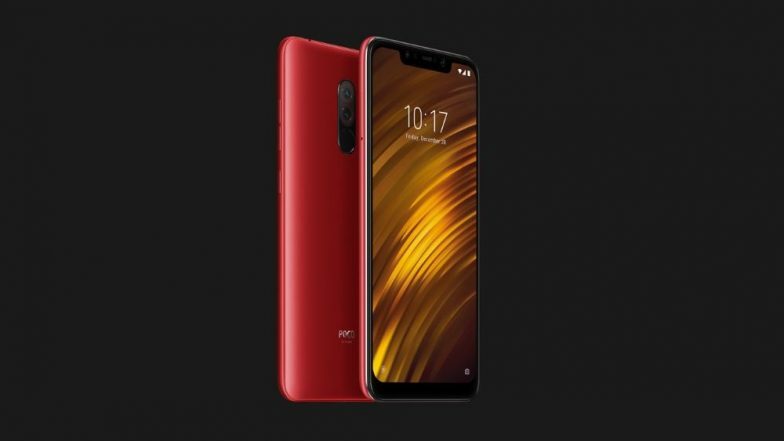 Xiaomi Redmi 7, Redmi Note 7 Pro Smartphones Launched in China; Prices, Specifications, Feature & More. In terms of optics, there is a dual rear camera setup which includes 12MP primary lens with dual-LED flash and a 5MP secondary sensor. For selfies and video calling, the Xiaomi Poco F1 comes with 20MP lens with f/2.0 aperture. The smartphone is backed by a 4000mAh battery with Qualcomm Quick Charge 3.0 support.